Fig. 1. 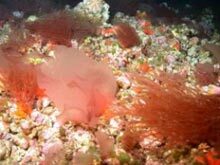 Several species of red algae grow on rhodoliths at about 75 m depth (225 ft) on McGrail Bank. Notable species include Halymenia, composed of large, flat blades (large pink seaweed, center); Gracilaria blodgettii, a cylindrical species (largest is in right foreground); Kallyemia westii, a pale pink species with perforated blades (extreme foreground, just left of center); and Coelarthrum cliftonii (whitish seaweed at top, just left of center). Image courtesy of FGBNMS/UNCW-NURC. Click image for larger view and more details. Image is best viewed in high resolution. Seaweeds are multicellular plantlike organisms composed of green, brown and red macroalgae, so-called due to the presence of particular pigments in their structures. They differ from plants by lacking true roots, stems and leaves, and in having a great variety of bizarre fruiting bodies and life cycles. Fleshy seaweeds are typically erect and grow on stony surfaces, in sand or on other algae, whereas encrusting algae form tightly adhering crusts on rocks. Because seaweeds are photosynthetic organisms (they require light to make their own food), they are restricted to the light-penetrating zone in the oceans. Although a few have been found at depths of 295 m in the Bahamas, deep-water seaweeds more commonly grow in depths above 100 m (Fig. 1). Most such seaweeds in the Northwestern Gulf of Mexico need a hard substrate upon which to attach their rootlike holdfasts (the portion of their bodies that anchors them to the substrate). 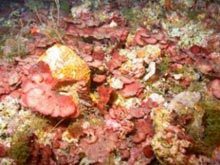 Many grow on unconsolidated rubble and on rhodoliths (round carbonate nodules surrounded by crust-forming coralline red algae) (Figs. 1 and 2). On silty mud bottoms, they may attach to a single shell (Fig. 3). Fig. 2. At 66 m depth (200 ft) on McGrail Bank, this field of red algal coralline nodules is covered with the red platelike alga Peyssonnelia inamoena and representatives of the brown algal genus Dictyota. Click image for larger view and image credit. Fig. 3. Most algae need a hard substrate upon which to anchor with their holdfasts. In silty mud bottoms they must compete with other organisms for space on available shell debris, as illustrated here by the red alga Gracilaria blodgettii at 100 m depth (300 ft) on McGrail Bank. Click image for larger view and image credit. 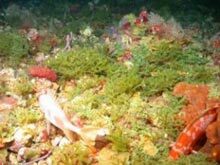 The study of these deep-water marine flora is fascinating, and not much is known about their biology. In general, the evolutionary (phylogenetic) relationships among seaweeds are in a continuous state of flux, and are, for the most part, unresolved. Representative species of the three major groups are present throughout the Northwestern Gulf of Mexico, and their ecological importance in reef and hard-bottom systems is well established (see Figs. 2, 5, and 6). For example, aside from being primary oxygen producers and carbon dioxide sources, seaweeds provide structural frameworks where invertebrates and fish live and hide (Fig. 4), and they are important sources of reef sediment and nutrition for a great number of herbivores (plant eaters). Thus, if the seaweeds were to disappear, the herbivorous fish and the invertebrates that feed on them would starve, as would the carnivorous (meat-eating) fish that eat them. Seaweeds are therefore essential to ecosystem health and longevity. Many species are also utilized as a source of food and natural products, from agar to pharmaceuticals. Did you know that more than 70 percent of all foodstuffs you buy in the supermarket contains algal products (including ice cream, canned foods, toothpaste, cookies and beer)? Fig. 4. 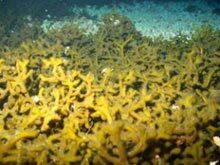 Some areas of Bright Bank are blanketed by dense mats of the spongy green alga Codium repens, as shown here at 60 m depth (180 ft). Click image for larger view and image credit. Fig. 5. 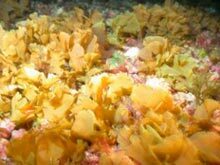 Some deep banks are dominated in terms of biomass by brown or red algae, and others by green algae, as shown in this region of McGrail Bank at 55 m depth (165 ft). Common are the grapelike Caulerpa racemosa, the spongy Codium isthmocladum, and the honeycombed, saclike Dictyosphaeria cavernosa (bottom left). Interspersed among these species are the leafy brown alga Lobophora variegata (bottom right). Click image for larger view and image credit. Contrary to the generally accepted notion that the Northwestern Gulf of Mexico is poor in seaweed diversity when compared to other parts of the Gulf or the Caribbean, our exploration in the region has revealed a surprisingly diverse deep-water flora. While such species diversity does not equal that of unicellular microalgae, or insects in a rainforest, even those seaweeds that have been named are still poorly known, and their affinities are, for the most part, unknown or wrongly established. For example, deep-water collections from depths of 50-200 m in the vicinity of the Flower Garden Banks National Marine Sanctuary are dramatically different from surrounding shallower depths (about 30 m), and typically consist of orders, superfamilies and families not found at shallower depths (see Figs. 1 and 3). Fig 6. Brown algal meadows are dominated by Padina profunda at about 55 m (165 ft) on McGrail Bank. Also shown are the spongy green alga Codium isthmocladum (right), the lacelike green alga Anadyomene lacerata (center) with the red grapelike Botryocladia pyriformis below, and the iridescent red alga Acrosorium sp. (bottom center). Click image for larger view and more details. Of particular interest is a deep-water flora dominated in number of species by gelatinous red algae whose members are separated from one another based on the early development of female reproductive structures (see Fig. 1). The green algae are dominated in terms of biomass by spongy members such as Codium (dead man's fingers) (Figs. 4 and 5) and the grapelike Caulerpa racemosa (Fig. 5), and the brown algae by leafy Dictyotales (Figs. 2 and 6). 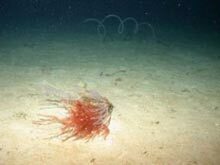 One reason they may survive and thrive at deeper depths is because there is less grazing pressure from fish and invertebrates than there is at shallower depths.